You want your garden to look at its best? But work in the yard often results in a big mess – a pile of removed weeds, branches, dry plants and fallen leaves. Not to mention the empty bags of gardening soils. However, we can take care of this nuisance for you! Simply call 020 3404 1106 today – Rubbish Begone offers cheap garden clearance in London! 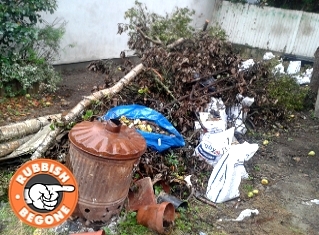 Choose Garden Clearance in London by Rubbish Begone! Due to lots of people asking us what the procedure we follow is, we decided to explain every breath we take, every move we make. Song lyrics aside, here is a comprehensive list we can share with you:1. First, give us a call and tell us what garden waste you have. 2. We will give you a free quote, so you can decide if you want to use our services or not! 3. After you book, we will arrive on the specified address in the specified time in a professional vehicle. 4. We will load the waste and we will secure it to be soundly bound inside the vehicle. 5. We will transport the waste to a licensed recycling point and leave them there for sorting. 6. Keep in mind we handle all types of rubbish, except hazardous waste. Yes, our phone operators are always ready to answer your calls! You can call at any time, have your questions regarding our London garden clearance answered and book a service immediately. The best part is you don’t have to change your daily routines for us, simply tell us what time suits you best and we will visit at the appointed hour! This is not enough for you? Combine garden and house clearance and receive the ultimate clearance service! Call Rubbish Begone Now – Order Our Superb Garden Clearance! It doesn’t matter how big your garden is and how much waste it produces – we will gladly rid your property of all leaves, branches and removed weeds! Simply dial 020 3404 1106 and talk to our polite office staff. For your convenience, you can book our London garden clearance service online as well! Did you know, that some of the plants you have in your garden can be used to dye clothing? Onion skin, walnut juice and tea bags – all those are good natural dyes. Also, the tallest sunflower in the world was 7.76m high!